Jackie set her case down next to her seat in community orchestra and unzipped it, pulling out her violin and bow. She rubbed amber rosin across her bow absently, her mind transitioning from the harrowing day in class to the Paganini piece she was soloing in. Measures 108-116 were still a disaster, thanks to being too exhausted to practice the past three days. The whine of microphone feedback jolted her attention to the room. Conductor Harte adjusted the mic before attempting to speak again. "We have a guest with us tonight. Anne Domanova, a trombonist from France who's visiting the States." Jackie followed her standmates' looks to the right of Harte's podium. A slight young woman with ruddy bronze hair stood holding a trombone that glinted light into Jackie's eyes. An older, dark haired man with rumpled clothes and glasses stood next to her, eyes on Conductor Harte, but whispering quietly to Domanova. "She doesn't speak English. Mr. Mattin is her translator." Jackie's eyebrow quirked as Harte continued, "I have been told she's written an astounding trombone part to accompany the violin in the Paganini number we've been rehearsing." They started with Bach, then stumbled through Beethoven. Jackie noted Domanova's disappointment at the performance as she turned the page. Jackie sighed. Her solo - now a duet - was going to be fun. 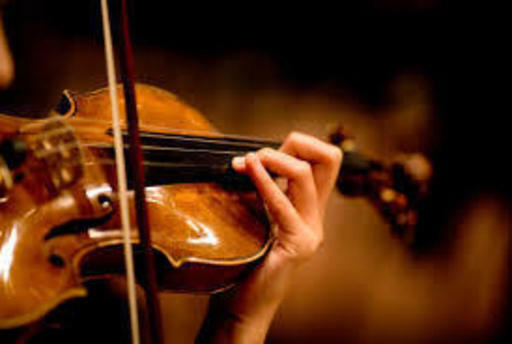 No matter how excruciating he was to practice, Jackie enjoyed Paganini the moment her bow hit the strings and the people around her swelled with music. He always had a way of charming her, and by the time the other instruments melted away into silence for her, she was comfortable, almost happy. Her strings were trilling out a high, singing tone, relishing the beginning of the solo when a deep, clear, and fully alive tone rang out across the room, and she almost stumbled on the next measure. She refocused on the lines in front of her, listening keenly to the mingling sounds. It was perfect. Jackie had no idea how she had played this piece for weeks without realizing it was incomplete. Hearing this - the resolute trombone sailing through her trilling, fluttering violin like a ship with an albatross circling its sails - filled her with a happiness this piece had never given to her before. When the strings swooped in at the end of the duet, Jackie looked across to acknowledge and congratulate their performance, but the trombonist was already quietly sitting down, turning the next sheet of music. She found her after rehearsal finished, meeting Anne's pale blue eyes with a bursting smile. "That- that was amazing. Absolutely beautiful. Thank...thank you so much." Anne's eyebrow lifted, a gracious indication of her incomprehension. Jackie's face fell, and she tried to stifle an awkward shuffle of her feet in the silence. After a moment of thought, Anne pulled out a page of sheet music and handed it to her. "Un jour, j'aie souhaité à joeur..." Jackie saw it was a duet. She placed it a music stand, gesturing to it with a question on her face. "Si'l vous plait," said Anne. They took up their instruments - the room empty now - and created a story, their hands speaking something together that their words would not, at least not yet. Going back for a repeat, Jackie looked up and saw Anne's eyes following her hands, the way a child might observe a butterfly. Then her gaze lifted to meet Jackie's, and her eyes crinkled in a soft smile. When it drew to a regretful close, Jackie pointed to the paper, made a writing motion with her hand, then pointed to Anne with her eyebrows lifted in query. "Oui," Anne said, with a nod and small laugh. "J'ai ecrit ça moi-même." "She wrote it herself," Mr. Mattin's scratchy voice broke the reverent peace of the notes still hanging silently in the air. They dissipated as he continued, "We are here for two weeks before we go to stay in Boston." Jackie nodded. "Will you be playing with us again?" she asked, looking to Anne. Mattin repeated her words in French. Anne nodded and said something that brought a hopeful smile to her face. "Yes," Mattin replied, now to Jackie, "She'll join your next rehearsal, and hopes to play in the performance next week." "What a treat. We all look forward to it." Jackie extended her hand. "I'm Jackie David, by the way." "Je presente Jackie David." said Mattin. Her name sounded silly, almost unfamiliar in a foreign tongue. Anne took her hand and gave it a firm shake. "Enchanté, Jackie." "Je m'appelle Anne, et vous?" "Je m'appelle...Jackie. Geez." After three tries, Jackie still couldn't pronounce her name the way Anne and Mr. Mattin did. She shook her head, glancing out the café's window to hide her embarrassment. "English now, okay?" Anne pursed her lips for a moment, registering the words, then nodded with a vague grin that reminded Jackie of a seasoned fencer facing a novice. "My name is Jackie. What is yours?" "Bravo." Jackie flashed a big smile, hoping to set Anne at ease, since she still gave the impression she was sitting at the edge of her seat, perhaps in distrust or caution in a new country, and city, around strange people. The clinking glasses and scattered conversations seemed to grow louder and their silence continued. Jackie pulled back into focus. "Hm?" Anne's blue eyes gazed boldly into hers. "Tu es belle, Jackie. Comment dit-ont....beautiful." Oh. She felt her cheeks become warm. Jackie bit her lip, not knowing what to say. Anne laughed, a gentle, tinkling laugh. She reached across the table and took Jackie's hand in hers. A full blush, now. "Merci, Anne."